RICHMOND, VA—For GPM Investments, LLC, 2018 marked their 8th holiday pinup campaign at approximately 1,400 store locations throughout the East Coast and Midwest, including Admiral, Apple Market, BreadBox, E-Z Mart®, fas mart®, Jiffi Stop®, Jiffy Stop, Li’l Cricket, Next Door Store, 1-Stop, Roadrunner Markets, Scotchman®, shore stop®, Village Pantry® and Young’s branded-convenience stores. GPM, with the support of their customers, worked together to raise $244,263 for kids and adults living with muscular dystrophy, ALS and related neuromuscular diseases. Throughout GPM’s partnership with the Muscular Dystrophy Association (MDA), beginning in 2011, they have raised a total of more than $1.38 million. 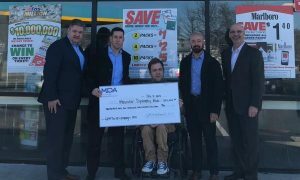 Throughout the month of December, approximately 1,400 GPM-operated stores participated in the fundraiser in which customers purchased an MDA pinup at check-out for a $1 contribution to help accelerate treatments and cures for muscle disease. Each customer who purchased a pinup received coupons as GPM’s way of saying “thank you” for their customers’ generosity. All signed pinups were then prominently displayed in each store. GPM executives Arie Kotler, President and Chief Executive Officer, and Chris Giacobone, Chief Operating Officer, presented the generous check of $244,263 together at fas mart® store #1 in Richmond, Virginia to Joel Shaw, Louise Zingaro, Executive Director of MDA of Greater Virginia and Niki Benfield, Care and Clinical Services Specialist. MDA is committed to transforming the lives of people affected by muscular dystrophy, ALS and related neuromuscular diseases through innovations in science and innovations in care. As the largest source of funding for neuromuscular disease research outside of the federal government, MDA has committed more than $1 billion since our inception to accelerate the discovery of therapies and cures. Research we have supported is directly linked to life-changing therapies across multiple neuromuscular diseases. MDA’s MOVR is the first and only data hub that aggregates clinical, genetic and patient reported data for multiple neuromuscular diseases to improve health outcomes and accelerate drug development. MDA supports the largest network of multidisciplinary clinics providing best in class care at more than 150 of the nation’s top medical institutions. Our Resource Center serves the community with one-on-one specialized support, and we offer educational conferences, events, and materials for families and healthcare providers. Each year thousands of children and young adults learn vital life skills and gain independence at summer camp and through recreational programs, at no cost to families. To learn more about MDA, visit mda.org.